After twenty years of un-wedded bliss, Georges and Albin, two men partnered for better or worse, get a bit of both when Georges' son (fathered during a one-night fling) announces his impending marriage to the daughter of a bigoted, right-wing politician. Further complicating the situation is the “family business”: Albin and Georges run a drag nightclub in St. Tropez, where Albin is the star performer “Zaza.” Georges reluctantly agrees to masquerade as "normal" when he meets the family of the bride-to-be. But Albin has other plans, with hilarious results. 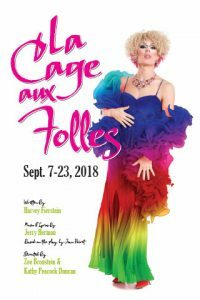 "La Cage aux Folles" is presented by special arrangement with SAMUEL FRENCH, INC.